Tikvah watched the jay as it fluttered onto the railing. It was a bright October morning, dry and warm. Mr. Roth stood deep in thought, gazing out at his back yard. Justine, his next-door neighbor, watched his face. She knew an important decision was at hand. “Yes, I think that’s exactly where we shall build it this year!” Mr. Roth finally announced. “We have our thanksgiving dinner inside our house,” Justine said as they walked down to the lower yard. 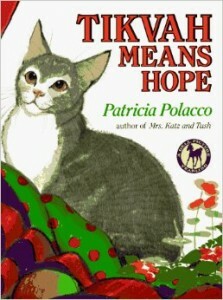 ”Patricial Polacco places her story of celebration and hope in the real-life event of the October 1991 California wildfires that raged in Oakland California. A heartfelt story of hope combined with Patricia Polacco’s characteristically rich pencil and gouache artwork. One of our most worn out and tattered by love books that we have read in the Sukkah since our daughter was 7.